I may have mentioned this before, but mythology is kind of my thing. I've had a lifetime affair with the legends, epics, and folklores found all over the world. If something is mythologically inspired, chances are I'm into it on principle. 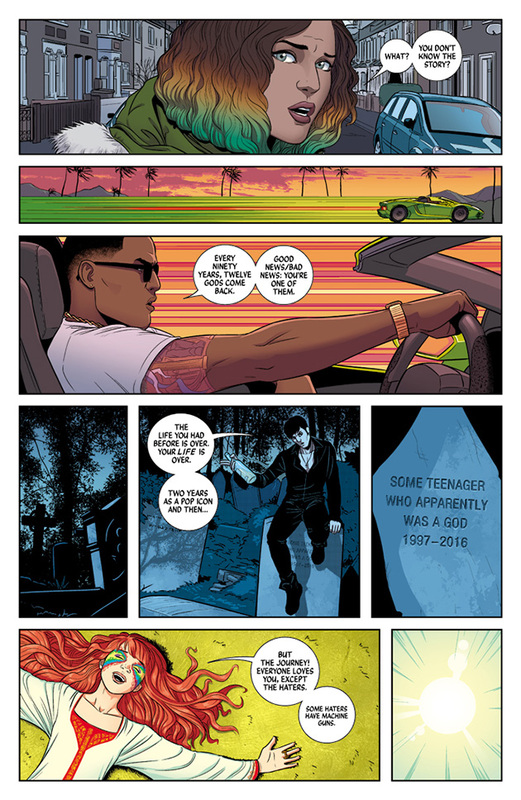 So that's why it's a surprise, even to me, that I let Kieron Gillen and Jamie McKelvie's The Wicked + The Divine slip by. 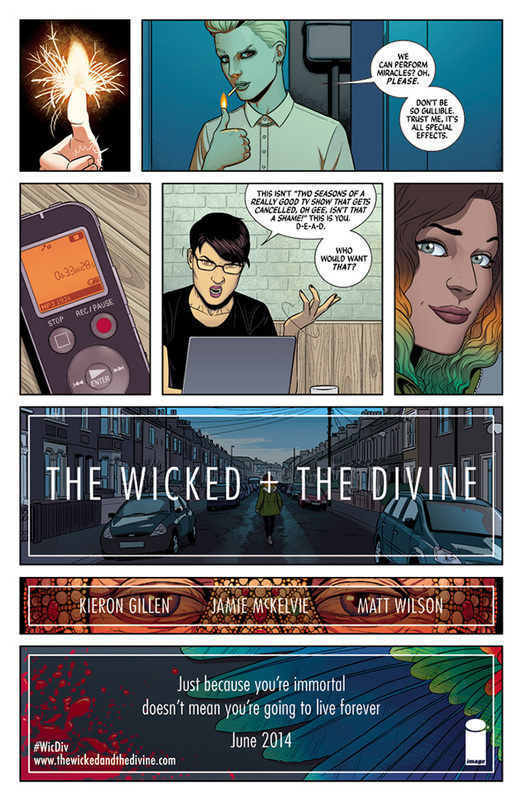 The Wicked + The Divine is an ongoing series that has been bouncing around my notice since it first debuted in 2014. It was widely acclaimed by fans and critics (as well as the blogs and podcasts on comics I listen to), and its premise should have drawn me to it immediately. Oddly enough, I hadn't taken the bait. I knew I'd relent at some point, and so here we are: I've finally read the first volume, "The Faust Act," and I'm kicking myself for waiting so long to check this series out. Every 90 years, an event known as the Recurrence reignites twelve deities from all ancient (and active) religions, bringing them forth inside already-alive individuals. Unfortunately, once godhood has been achieved the deity only has two years to live. The brighter you burn, the faster you go out. Now it's 2014 and the Pantheon has returned once more. And since gods require only attention and adulation, they choose to become the only logical choice: pop stars. Our protagonist, Laura, is absolutely obsessed with the Pantheon, and wants nothing more than to be like them. After seeing a performance by the goddess Amaterasu (and subsequently passing out), Laura is invited by Luci (literally Lucifer) to hang with some of the Pantheon backstage. There, a journalist and skeptic named Cassandra is interviewing Amaterasu, until two unknown assailants open fire at them from the top of a nearby building. Luci protects them, but is put on trial for their murders. When the judge is then killed during the proceedings, Luci is thought to be the culprit. Laura is positive it wasn't her, and so she takes the time to meet with the different gods and goddesses to see who, exactly, is framing Luci. The Wicked + The Divine isn't so much a commentary on religion or divinity as it is on the effects of fame. The Pantheon is made up of dynamic and powerful personalities, and even though it is the spark of the divine that gives them this charisma, their effect on mortals and on themselves is an allegory of stardom all the same. All of the gods are musical performers (Gillen has even provided a playlist if you're so inclined to see his inspiration), and the comic is filled with musical references and allusions. It's the musical part where I personally stumble a bit. I can tell that many of the characters are shout-outs to several artists: Luci has a certain David Bowie-esque androgyny about her, and even receives a bruise on her face that reminds me of the Aladdin Sane look; Baal is inspired by, if not directly copying Kanye West; Sakhmet has a lot of Rhianna going on; Wodon is, I don't know, Daft Punk? My music knowledge is too meager to pull out all the references, but audiophiles are sure to appreciate the parallels. Gillen is a talented writer and story teller, and each character's personality comes through with the right amount of attitude. Whatever well of creativity that Brian K Vaughn channels for dialogue and language, Gillen seems to have tapped into it as well. The character's speech patterns are spot on, and Gillen's voices are (for the most part) tuned in to modern youth culture and mannerisms. He and McKelvie display this in clever ways: when Laura pulls out her phone, it has the ubiquitous cracks of a teenager's cellphone screen. McKelvie's art is gorgeous and his character models are rich and detailed. And speaking of character models, the series does a great job of being as diverse as possible. Almost every race, color, gender identity, and sexual orientation is represented in some capacity, and never in a "token" way. The comic isn't perfect: there are some parts where the attempt to connect to the millennial zeitgeist gets cringeworthy. And overall it's difficult to get into if you don't initially understand the premise. McKelvie's art reaches divine heights, but on some pages the characters and their expressions can appear stiff and inflexible. These small points aside, did I like this comic book? YES. How much so? After finishing the first volume and being left on a cliffhanger, I immediately purchased the second volume and read it during my lunch because I just had to keep going. The Wicked + The Divine is an imaginative, intelligent, and thoroughly modern comic book and one of the coolest series I've read in a long time. I highly recommend checking it out, and you can be sure that this won't be the last one we review.